I’ve been a huge fan of Buffalo FX for years. They make amazing sounding pedals and I’ve had the pleasure of reviewing most of them. A couple are staples on my pedalboards. So there, I’ve set the standard for this review of the Patriot MkII. The Patriot is Buffalo’s take on the early 90s so-called Civil War Big Muff for Sovtek – a version of the Big Muff that went through several changes during the 90s and that was recently released by EHX as the Green Russian. I did a review of the Patriot a few years back and as then, I am now equally impressed by its low noise floor and authenticity towards those old pedals. The Sovteks has always been my favourite Muffs and the Patriot captures that thick fuzz-like character, with lots of harmonics and sustain. What’s new this time is the addition of a mid range boost and low end or bass cut. Big Muffs are notoruous for lacking mid range, which is what you will need to cut through a band mix. Especially if your amp lack of bit mids too. Increasing the mids adds a nice presence and punch to the tone, allowing the Patriot to cut through. The low cut rolls back some of the low end, cleaning up the tone and allowing even more mids and presence to cut through. Having both these controls really makes it easy to dial in a tone tailored for any amp and pickups. What I’ve always loved about those early Sovteks is their ability to deliver dynamic and useful tones on low gain settings. The Patriot cleans up well, although not entirely – this is a high gain Big Muff after all – and it can easily be doubling as an overdrive both for rhythms and lead. At full gain it gets that almost throaty character you can hear on Pink Floyd’s Pulse. It responds very well to low output single coils in particular and the sustain really allow you to shine thoughout a lead part. 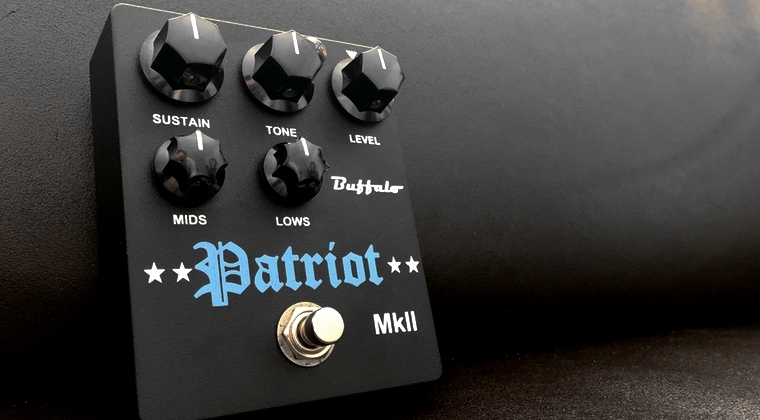 So again, the Patriot MkII is highly recommended if you’re seeking those classic early 90’s Big Muff tones and particularly if you need a bit of extra controls to perfectly match the pedal with your amp and guitar. See Buffalo FX for more details. Hi Bjorn! I have a vick audio 73 rams head and I really like it. To achieve pulse tones, what you think that is better, ehx green russian, buffalo patriot mkii or wren cuff civil war? Thanks! That’s a Hagstrom Northen Swede. Works great although the mid range boost pretty much takes care of the boosting. wow! your playing is getting better and better! amazing tone you got there! Any chance of a south america Airbag’s tour? I’m from Argentina, I would love to heard you and your band live. Great review as always. I’ve followed your site for years, and really like all of your solo work, and I’m looking forward to your next release. Are you running a unit 67 with the Mkll? Also are your humbuckers in the first section stock or custom wound? I love the tone and your arrangement of this clip. It has a very soulful sound. Thank you! Not using the 67 here. Only the Patriot. The humbuckers are stock on the guitar. I think they’re made for this model by a Swedish luthier. Basically PAFs with a tad more output and sparkle. I just wanted to drop you a line and say a huge Thank You. I recently found your blog and have been scouring through this vast treasure trove of knowledge for hours and hours at a time. The depth of your breakdowns and attention to the details is incredible. Your passion and dedication is hugely appreciated and the fact that you’re offering this all online is truly generous. Much to the discontent of my neighbors, I probably haven’t turned off my amp since discovering your blog, but at least for the neighbors my tone is improving ;) Keep posting the good stuff, man! How well does it match bedroom set-ups & low-power amps? Also, could you at some point provide an opinion on Marshall’s Origin 5 & DSL5C amps, especially regarding their ability to work with the boost/muff (or fuzz) combinations that seem to be integral to David Gilmour’s tone? The Patriot works nicely on bedroom setups and lower volume but keep in mind that Muffs needs a bit of mid range, compression and volume to really shine. I wouldn’t combine it with a smaller Fender or Vox. Thanks. Problem is, Hughes & Kettner amps don’t have a dealership in Greece anymore; Marshalls, on the other hand, are readily available. You are making me break the bank. Every demo you do, makes me want the pedal you demo! About the Patriot, what will it give me sound wise compared to the M1. I have been using the M1 for a while now and am wondering if the new Patriot would give me anything different than what I have now. I know there is a mid boost and low end cut, but would you say that allows for many more options than what I have in the M1. I will add I am very happy with my current tones, but you know how it is……We can always do better! The Patriot has a touch more mids and an overall darker and more mellow tone. The mids and bass controls also makes it easier to tweak for different voiced amps. The M1, as you know, is fairly aggressive and brighter sounding. Are there any tonal differences between MK1 and 2, when MKII are set to a “neutral” setting without mids and bass bump? Ie. are there baseline of the circuit the same? Really love the melody you’re playing in the clip! Is that parts of the same melody that you used as a signature intro on reviews earlier? Thanks for all your efforts put into this site! I’ve learned tons of great stuff! ? Hei Bjørnar! Takk for hyggelig kommentar! The clip is new and something I put together for this review. As far as I know, the main circuit is the same. I can’t hear much difference anyway. Wonderful music and playing! How about selling your hands?